Thank you for saving our school! Thank you to everyone who donated in funds and in kind wishes. Thanks to you we raised enough to avoid getting evicted and start a scholarship fund! Thank you, friends, thank you! The Friends of the Red Barn is a 501(c)3 non-profit organization whose mission is to support music making at the Red Barn in Amherst, through scholarships, concerts, and promoting the arts. Formed in 2012 by concerned families, the Board of the FOTRB includes: Catherine Sanderson, Chair; Sandi Wolfe, Vice-Chair; Tammy Rahhal, Secretary; and Andrew Parker- Renga, Treasurer and Kate Atkinson and Sandi Burkett, Members-At-Large. The Friends of the Red Barn will offer scholarships to families with need, based on the availability of funds. In the past, Red Barn teachers have accepted students on a sliding-fee basis and we want to support them in this. 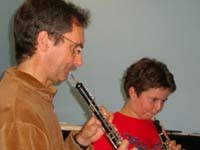 Offering good, solid music education to the youngest children will prepare them for success, in every part of life. The Red Barn teachers typically have Mass K-12 certifcation and training in disciplines such as Orff Music and Kindermusik, based on the latest research and understanding. Your donation will make that possible, too. Every year, the Red Barn puts on student, faculty and Guest Artist concerts and program sponsorship opportunities are available. Classical, Jazz, Folk, Popular, we have done it all. Please inquire. Thank you for your support, please let us know if you have any questions.